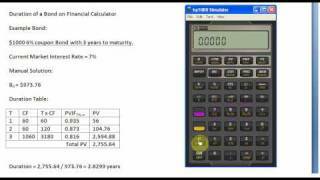 Calculating Duration on Financial Calculator – What? Why? How? A demonstration on how to use the financial calculator to find a bond’s duration. Thanks! This is much clearer than the explanation in the book! how u find NPV for semi annual? with xP/YR entered as 3, instead of N as 3.
good stuff. Works with the 12c also. thankyou GONNA HAVE EXAM SOON! managed to teach our professor something new.